Get ready for Generation Z, because they are coming to a workplace near you. Currently aged between 10 and 24, Gen Zs are 4.6 million strong in Australia and number just short of one million in New Zealand. By 2025, these post-Millennials will make up 27 percent of the workforce. For the first time, we have five generations participating in our workforce. What can we expect from this newest group? Well, they are the first generation to be raised on mobile devices and social media – most won’t remember a world without Netflix, Spotify, Instagram and Snapchat. As well as differing experiences, it is becoming apparent they have got different expectations from the older Gen Y cohort too. 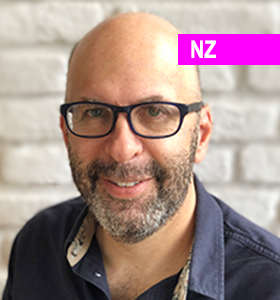 In this session, Paul will provide a snapshot of how a selection of Talent Leaders on both sides of the Tasman are adjusting their strategies to attract GenZennials. Then we will get the opportunity to hear from a group of Gen Z HR students/future Talent management professionals. Paul will tease out their career expectations, hopes and fears, and the drivers that attract them when weighing up different employers. Paul founded Jobgram, a recruitment marketing studio, to help employers stand up, stand out, and win the hearts and minds of jobseekers and employees. He works with employers across the globe, from New Zealand and Australia to the United States, Asia, Europe and the United Kingdom. He’s partnered with employers like Deloitte New Zealand and Cigna New Zealand to create award-winning employer branding and social recruiting strategies. He’s also pioneered initiatives like first-person point-of-view interactive video with built-in gamification (think Black Mirror Bandersnatch), augmented reality, animated job advertising, and – way back in 2009 – live-streaming Q&A on Facebook. Paul enjoys keeping up with emerging tech, consumer and user trends and applying these to an employer brand context. In his spare time Paul challenges his mind and body by running marathons.